The Bighorn River water flows have remained steady at 5500 cfs for several weeks. Inflow is roughly 2500 cfs and Boysen Reservoir is 61% full. We have a very large snowpack in the mountains surrounding the Bighorn Basin, and our first 80 degree weather is projected over the next few days. Lots of melting is going to happen, and we will keep you posted on conditions. Despite the winter storm this weekend and weather patterns the last few weeks we have been catching trout. It is not lights out like most Aprils we are all used too, but fish have to eat and our guides and guests have been bringing in a few nice sized trout each trip. Dunoir Fishing Adventures is happy with the high water! It should only help the fish populations and definitely helped the spawn this spring. We have more guide trips going out this week. 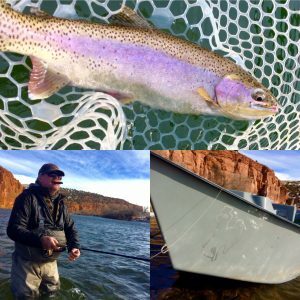 Keep posted for more fishing reports and to check current water conditions on the Wind and Bighorn River please go to the Bureau of Reclamation’s website HERE. Fontenelle Dam is scheduled to up the water release over the next few days. Guide Spike was on the Green River last week and water was murky with some improvement as the day went on. The fishing conditions aren’t as good as we saw them in while guiding in February and March. Weather temperatures will be increasing in the area over the next few days as well. The fishing will pick up once we get through some weather, snowmelt, and more stable conditions. Here at Dunoir Fishing Adventures we always have somewhere to fish even during challenging conditions. To see more information on the Green River below Fontenelle click HERE. Keep posted for more reports to come. 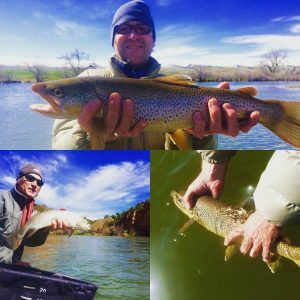 Bighorn River, Green River, Wind River Fishing Report: BIG WATER is here in Wyoming! 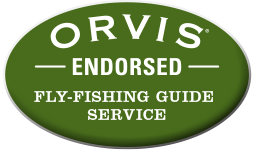 Our guides and company love to fish BIG water, and our motto is BIG water, BIG fish. These are some of the largest river flows that we have seen in April. Usually, our big water comes in during May, but this year the Bureau of Reclamation on the Bighorn/Wind River and Green River are letting out water much earlier this year in anticipation of the big spring runoff coming from the mountains. We applaud the Bureau of Reclamation for releasing water earlier this year with hopes that the rivers will not be flowing ridiculously high all summer. Fishing on both the Bighorn and Green Rivers has been decent. This last weekend was tough on the Bighorn River due to murky water (rain) and unstable flows. The key to good fishing with big water are flows that remain stable. They have been working on Boysen Dam and have had to adjust flows to accommodate that. Currently the river is at 3900 cfs, but will be bumping back up to 5500 cfs for ten days starting tomorrow. Hot flies include: annelids, sow bugs, and baetis patterns. We are starting to finally see some nice blue wing olive hatches. Keep posted for more to come! 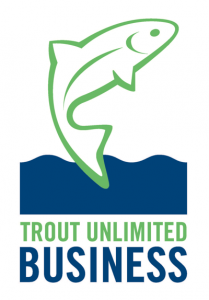 To see current river flows for the Bighorn River click HERE. To see current river flows for the Green River click HERE. Green River Fishing Report: Guides Jeramie and Jeff scouted the Green River below Fontenelle Dam two days ago. The boat ramps were snowed in and temperatures were cold, but the fishing was lights out! Big browns and rainbows most of the day. Hot flies include: midges, sow bugs, worms, and baetis patterns. We will be guiding multiple days on the Green River this week so keep posted. 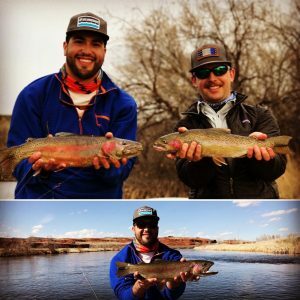 Bighorn River Fishing Report: The Bighorn River in Thermopolis is fishing well right now. We received a good amount of snow making ramps a bit cumbersome, but the fishing is pretty good right now. Not too many browns, but lots of rainbows. River is ice free and floatable to Hot Springs State Park. Hot flies: midges, sow bugs, worms. Keep posted for more reports to come as we are guiding in the next few days! 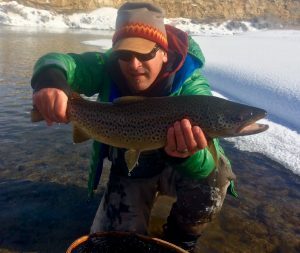 Green River Wyoming Fly Fishing Report: The fly fishing on the Green River was fantastic today. We teamed up with guide Ryan Hudson with Green River & Bridger-Teton Outfitters guiding a group of serious falconers who hunt with their falcons every year here in Wyoming. Conversation was rich in the boat today. The guys fished well catching Kokanee Salmon, rainbow trout, and scads of whitefish. We avoided the brown trout redds and didn’t manage to pull one all day between two boats. 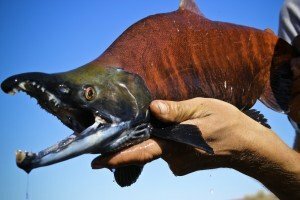 The Kokanee run is about over with lots of dead fish in the water. The weather was outstanding with zero wind and perfect temperatures. Rare for the Green River. Keep posted for our Bighorn River report soon.